Did an iPhone actually interfere with an airplane’s navigation during flight? That’s the claim that went out over the Web yesterday, as Bloomberg reported on a small regional airliner whose compasses glitched-out at 9,000 feet. The incident, which occurred in May 2011, led pilots to veer several miles off course. But then a flight attendant took action and convinced a passenger in the ninth row to shut off an Apple iPhone. According to a report filed with NASA’s Aviation Safety Reporting System by one of the co-pilots, the issues stopped as soon as the device was turned off. Circumstantially, it’s pretty convincing. And it flies in the face of Sen. Claire McCaskill’s mission to halt the “irritating” policy and allow broader use of mobile devices on airplanes. But here’s the thing: No investigators or researchers stepped up to corroborate the glitch in this incident, and no one duplicated the phenomenon. The idea that the iPhone caused the problem came from one pilot’s hunch, says The New York Times, and that’s it. So does that mean we should be allowed to use our mobiles with reckless abandon on flights? Well, that’s the point of contention, particularly since the risks are still in question. Apparently Wi-Fi, which is available on many airlines, isn’t so much the problem as cellular radios, like those in smartphones, certain tablets and readers. Depending on the device, the antenna can be rather powerful. As it goes out searching for a signal, it can throw things like GPS and other navigational systems out of whack. Now, this was truer in older gadgets, but the risk is presumably still there. That risk could be extremely remote, however, at least judging by the math. 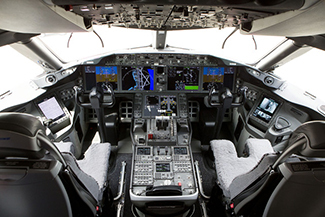 Even though the Federal Aviation Administration prohibits use of many such electronics while a plane is below 10,000 feet, two recent studies — the Airline Passenger Experience Association and the Consumer Electronics Association — reported that up to 30 percent of airline passengers admitted to leaving a device powered on during takeoff or landing. In 2010, when 712 million passengers flew in the U.S., that would’ve amounted to approximately 213 million people. If these gadgets posed real dangers, wouldn’t we see far more incidents of airplane systems going haywire because of them? Now that’s an interesting scenario. How do you police a plane full of passengers once wearable technologies become more adopted? The F.A.A. promised last year to review its policies on electronic devices in all stages of flight, so it shouldn’t be long before those findings come out. 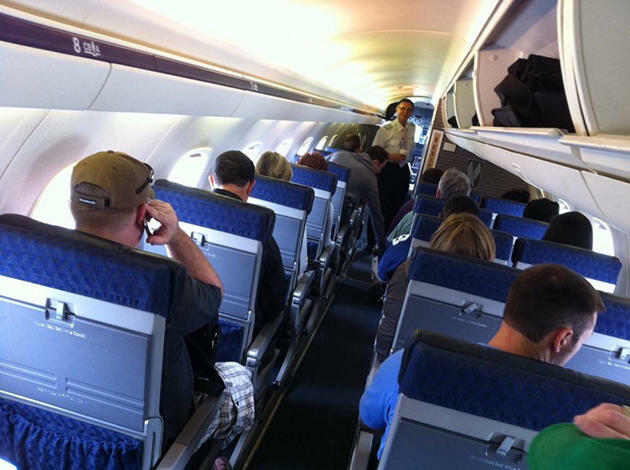 In the mean time, tell us where you stand on this issue: Should passengers continue to be prohibited from using their devices while flying, just to play it safe, or should the rules be relaxed pending concrete evidence?